Today marks a major milestone for NodeSource. We have been working tirelessly since the formation of the company toward this hallmark event: the launch of our flagship product, N|Solid. I am pleased and proud to announce that today we begin shipping N|Solid, a platform built on Node.js and designed specifically for the unique needs of the enterprise. The N|Solid platform delivers unparalleled insight, control and protection for mission critical Node.js applications. You can use the N|Solid runtime anywhere you’re using Node.js today. 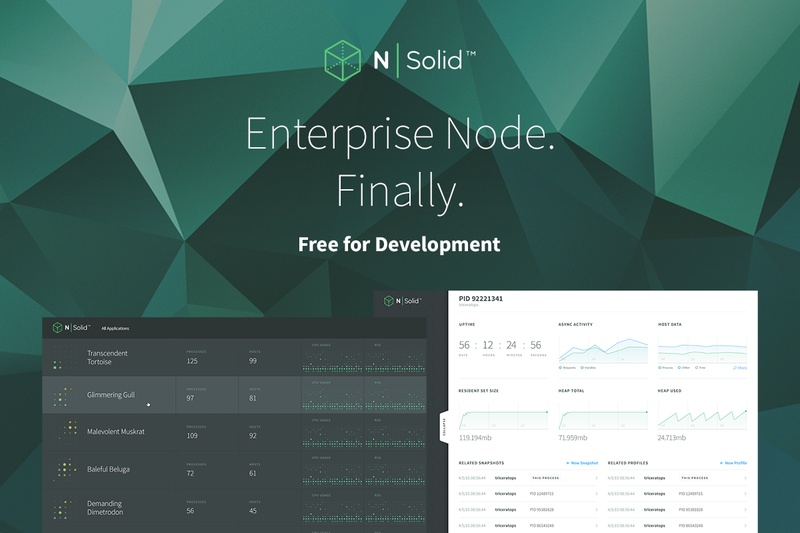 N|Solid delivers an integrated NodeSource product experience and provides enterprise-grade enhancements to improve troubleshooting, debugging, managing, monitoring and securing your valuable Node.js applications. When we shared with customers, partners and Node community members, that we were building an enterprise runtime platform for Node.js, we received resounding, consistent feedback: “don’t change Node.js” and “don’t fork Node.js”. We have worked with the entire Node.js ecosystem to bring together the needs of Node.js and io.js users under the Node.js Foundation. We’ve tripled the number of core contributors. Node.js and this community are why we exist and why we love what we do. We’re fervent about protecting, promoting and sharing it with others. N|Solid is a commercially supported runtime product that is Node.js at its heart and designed to stay that way, growing and maturing with alongside Node.js. 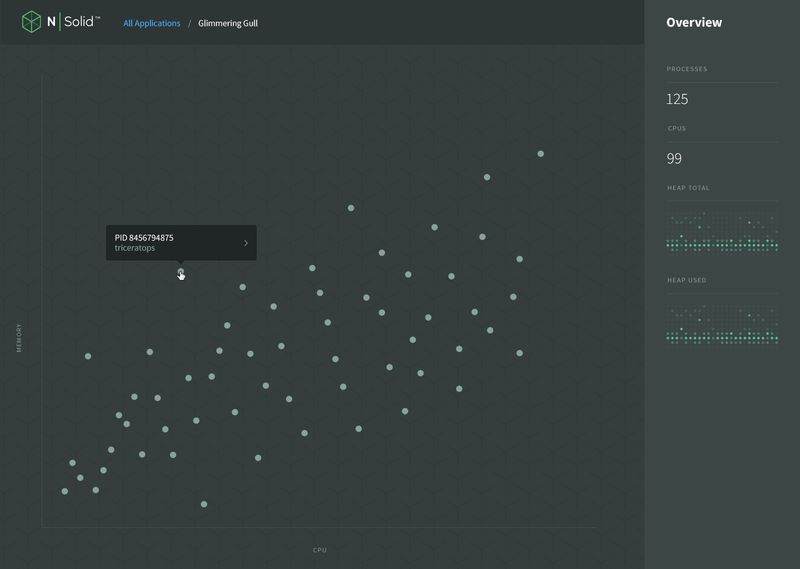 We’ve instrumented the N|Solid platform and its underlying Node.js core to provide deep insight into runtime health and operational quality. We deliver these metrics in realtime without adding a performance penalty to your Node.js applications through N|Solid’s unique management infrastructure. N|Solid runtime introspection provides meaningful insight into the runtime process and the underlying operating system. This includes in-flight asynchronous event processing, visualizations of key performance metrics, and the monitoring of Node.js-specific telemetry for a more complete view of application behavior. N|Solid features fully integrated profiling that requires zero code modification to drastically reduce troubleshooting time. With one-click CPU profiling and on-demand heap snapshots, N|Solid radically simplifies performance analysis by enabling you to quickly identify issues. Node.js applications can be debugged and profiled live, without the need to restart, and therefore potentially miss critical state that led to the fault. I hope you’ll agree, that N|Solid and especially the N|Solid Console are beautiful. At NodeSource, user experience is paramount and a key element of delighting the user is design. We’ve worked hard to make N|Solid simple and easy to use. It’s the product of rigorous software engineering and an obsessive attention to user experience. 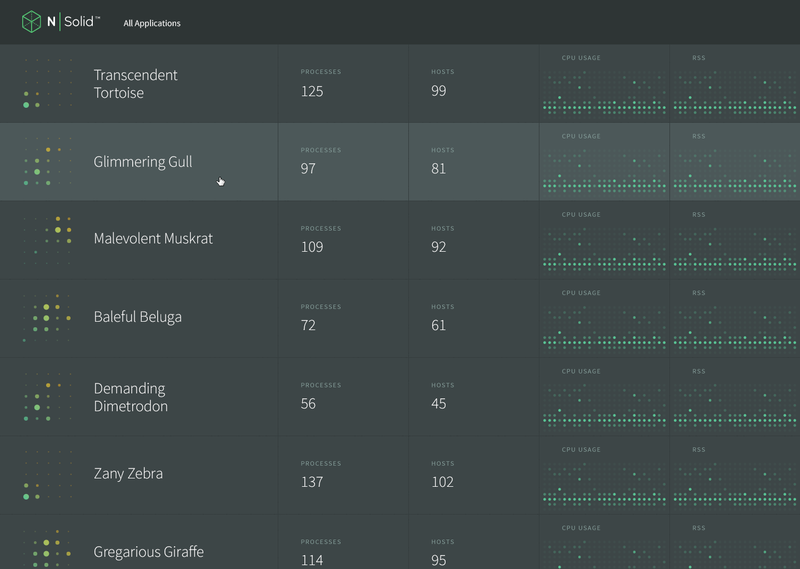 We’ve worked hard to ensure that the metrics, the visualization and every workflow delivers an incredible Node.js experience. At NodeSource, we put in the effort to go beyond drab and utilitarian to deliver the future of awesome for the enterprise. Although security is not always the attention grabber for most developers, it is a perennial issue for enterprise operations and support teams. N|Solid enables unique security policies for managing and controlling the runtime. Through these security policies, you can limit or restrict core module usage to maintain consistent control across vast deployments. Through N|Solid security policies, you can choose to trade performance for rigor and enable protected memory allocations. You’re in control. N|Solid was created to deliver an end-to-end experience uniting the needs of developers, devops and operations teams. Enterprise Node.js users have been clamoring for greater operational insight and greater control. With great relief, enterprise teams can finally relax and know that they have a purpose-built platform that addresses their needs. N|Solid is free for unlimited development usage and licensed for production usage. Every subscription license comes with world-class 24x7 NodeSource product support backed by our proven N|Support team. 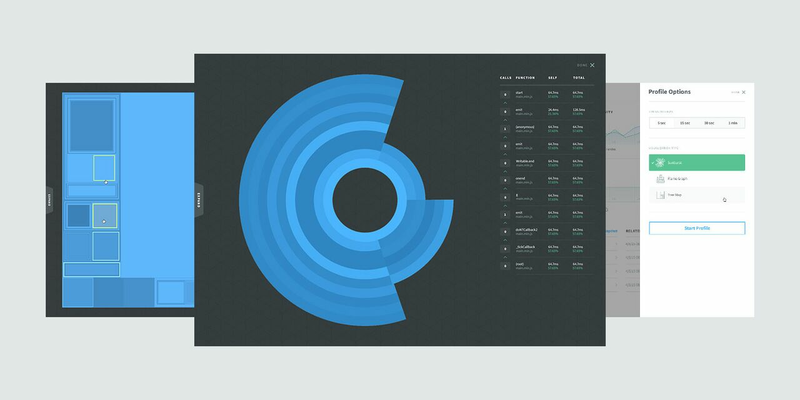 NodeSource is dedicated to your success with Node.js. Download N|Solid today and let us know what you think. Start with the runtime. You’ll be up and running in no time. When your application is ready, add a hub to connect clusters of processes across systems. Finally, uncork the full potential of N|Solid by connecting this to the console where you’ll be able to manage constellations of clusters and seamlessly transition from viewing cluster health to pinpointing and resolving issues in a single process.